If you're planning on relocating to Bucks County area, you're making a wise choice, as we have much more to offer than just beautiful homes and rolling hills. Perfectly located right outside of Philadelphia and close to New York and New Jersey, people from all over the country are relocating to Bucks County area. Bucks County has a great variety of homes to choose from including condos, townhomes, luxury homes, new construction and 55+ / Active Adult communities. Residents of Bucks County enjoy an array of indoor and outdoor activities to partake in, so please browse below for more information on various activities and attractions to enjoy in Bucks County. 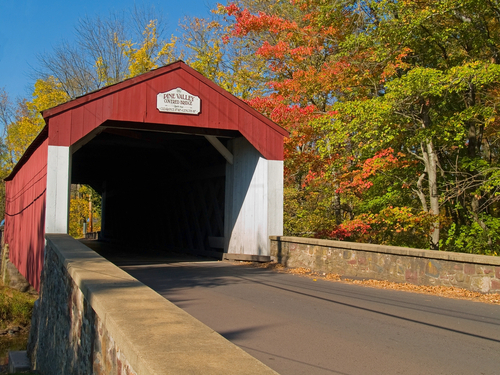 You will absolutely love living in Bucks County! If you’re planning on relocating to Bucks County and have any questions about the area or available real estate for sale in Bucks County, contact Russell Volk and he will be more than happy to assist you with the move to our beautiful area. If you're planning on visiting our area, please make sure that you spend some time at the following attractions. You will not be disappointed. Since Doylestown is located in Central Bucks County, all distance times will be based from Doylestown. The climate in Bucks County is typical of any area on the east coast. During the summer months, a typical day would be around 85 degrees with about 50% to 80% humidity. A typical winter day would be around 40 degrees with some snow every now and then. Due to higher elevation, temperatures in Upper Bucks County are naturaly cooler than in the Lower Bucks. Average yearly snowfall is 20 inches. As you can see, Bucks County is beautiful, diverse, culturally rich, located perfectly for an easy commute just to about anywhere. Visit our area and visit various attractions and neighborhoods and when you're ready to move to Bucks County, contact Russell Volk and he will be happy to assist you with your home search.